We also caught press conferences from Namco Bandai and Grasshopper. Here's your complete summary of our on-going coverage of Tokyo Game Show, pre-day 1. Diabolical Pitch is an upcoming Kinect game from Grasshopper Manufacture, the studio responsible for titles like No More Heroes. Japanese developer Grasshopper Manufacture, the team behind games like No More Heroes, is moving into the mobile gaming scene after teaming up with Japanese "social network operator" DeNA. Normally, I'd sit down to play a sequel (in this case spiritual, if not official) and notice what's different. Not today. Playing Dark Souls at Namco Bandai's pre-TGS showcase was like seeing a friend the day after you last saw them, and all that's changed is the shirt they're wearing. Having tried out Armored Core V's co-operative multiplayer mode at Gamescom last month, at yesterday's pre-TGS Namco Bandai showcase event I got my hands on Armored Core V's singleplayer. It was...well, it wasn't easy on my eyes. Square Enix will bring PlayStation 2 role-playing game Final Fantasy X to the PlayStation Vita and PlayStation 3, the company announced today, giving the 2001 video game a high definition makeover. And the ports just keep on coming! PlayStation Vita owners will have even more high-def versions of classic games to play on the go as Metal Gear creator Hideo Kojima has revealed that the previously announced Metal Gear Solid and Zone of the Enders HD collections will also come to Vita. On December 17, the PS Vita will go on sale in Japan. When it does, it will have a whole host of titles to support it. Today, at Sony's pre-Tokyo Game Show press event, the handheld's launch line-up for Japan was revealed, twenty-six titles strong. Not All the Japanese Launch PS Vita Titles Are "Games"
Several of those, like NicoNico Douga and calendar app Yuusha no Kiroku, are not launch games in the tradition sense. How About Two New PS3 Colors? Okay, Then! 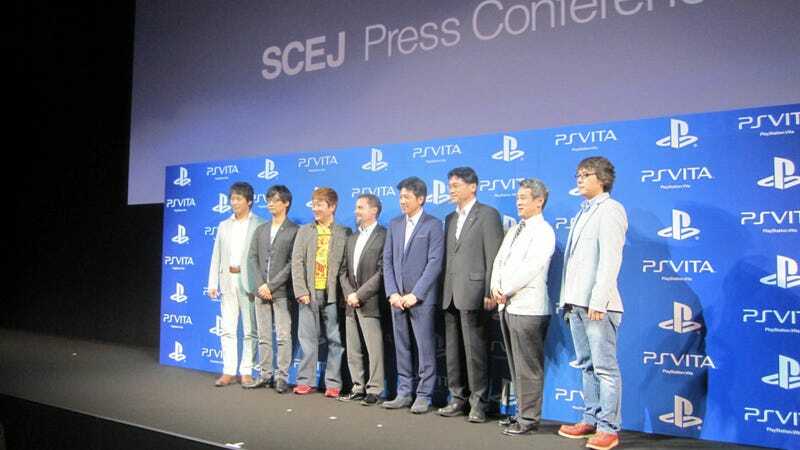 At today's pre-Tokyo Game Show press conference, Sony revealed two new PS3 colors: Splash Blue and Scarlet Red. This December, Sony is launching two PS Vitas. One model is the cheaper 3G model. The other is a 3G version. A new gaming portable means more than new games. It also means new peripherals, and that's exactly what Sony is giving the PS Vita. Can You Tell Your WiFi PS Vita from Your 3G Vita? Sony is launching two PS Vitas: One is a ¥24,980 WiFi model. The other is a ¥29,980 3G model. Can you tell them apart? On Nov. 17, Sony is releasing two new PSP value packs for the PSP-3000. One comes in black, and the other comes in red.